Allison focuses her practice on land use law, environmental impact review, environmental regulation and permitting, and associated litigation. Her educational background in environmental law and policy, as well as urban planning, gives her multidisciplinary perspective of the land use process. 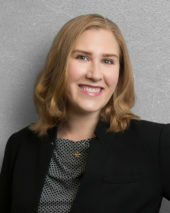 Prior to joining SPR in 2018, Allison practiced in the Land Use, Zoning & Development Group at Cuddy & Feder LLP, where she gained expertise in representing a wide variety of telecommunications and land use projects, including Community Distributed Generation (CDG) solar developers, across the lower Hudson Valley. Allison is a graduate of the Elisabeth Haub School of Law at Pace University and Yale School of Forestry & Environmental Studies joint-degree (Juris Doctorate/Masters in Environmental Management) program. During law school, Allison served as the Pace Environmental Law Review’s Research & Writing Editor. She was Research Assistant to Professors Leslie Garfield Tenzer, Shelby Green, and John R. Nolon, and was Project Manager for Professor Nolon’s book Protecting the Environment Through Local Land Use Law: Standing Ground (2014). She additionally served as Managing Editor of the American Planning Association’s Planning & Law Division Student Editorial Board. She was also Vice President of the Land Use & Sustainable Development Law Society and Secretary of the Public Interest Law Students Organization. While completing her Master’s in Environmental Management at the Yale School of Forestry & Environmental Studies, she served as Research Assistant for the Pace-Yale Land Use Collaborative’s Local Governance of Shale Oil and Gas Development Project, and has co-authored a law review and lectured on the role of local governments in regulating the impacts of hydraulic fracturing.